Comparative study of alloimmune responses against major and minor histocompatibility Ags has been limited by the lack of suitable assays. Here, we use a bioassay that permits tracking of alloreactive CD4+ T cell populations as they proliferate in response to major or minor histocompatibility Ags in vivo. Division of alloreactive CD4+ T cells proceeded more rapidly in response to major histocompatibility Ags than minor Ags, although CD4+ T cells alloreactive to minor Ags had a similar capacity to divide successively up to eight times after stimulation. Allorecognition of minor histocompatibility Ags was highly dependent on CD28 costimulation, with the frequency of CD4+ T cells proliferating in response to minor Ags in the absence of CD28 costimulation reduced up to 20-fold. These findings highlight differences in signaling processes that lead to allorecognition of major and minor histocompatibility Ags and have implications on the design of interventions aimed at abrogating these responses. Alloimmunity represents a markedly polyclonal response of the immune system against histocompatibility Ags expressed by transplanted tissues. CD4+ T cells are central to this response, being absolutely required to initiate rejection of allografts in certain settings 1, 2, 3 . CD4+ T cells recognize major and minor histocompatibility Ags via distinct pathways. CD4+ T cells recognize MHC class II molecules of donor origin with bound peptide ligands on the surface of allogeneic cells 4, 5, 6 . Minor histocompatibility Ags are peptides recognized by CD4+ T cells in the context of donor MHC class II when the donor and recipient are MHC identical and in the context of self-MHC class II after processing by recipient APCs 7, 8 . Promiscuous recognition of allogeneic MHC with peptide ligands is thought to provoke potent T cell responses against major histocompatibility Ags, represented in vitro by vigorous primary MLR 6, 9, 10, 11 . On the other hand, the study of alloimmune responses against minor histocompatibility Ags has been limited by the unavailability of assays that can detect the response of a T cell repertoire to minor Ags. Minor histocompatibility Ags fail to induce detectable T cell proliferation in vitro despite the fact that transplanted tissues mismatched for minor Ags are rejected almost as rapidly as MHC incompatible allografts 12 . Therefore, comparison of the cumulative response of a T cell population against major and multiminor histocompatibility Ags has not been feasible. In this study, we use a bioassay that permits characterization of the in vivo kinetics of CD4+ T cell division in response to major as well as minor histocompatibility Ags. In addition, we demonstrate distinct requirements for CD28 costimulation in CD4+ T cell responses against major and minor histocompatibility Ags. C57BL/6 (H-2b), C57BL/6-Cd28tmlMak (H-2b), BALB/c (H-2d), C3H/HeJ (H-2k), and C3H.SW-H2b/SnJ (H-2b) mice were purchased from Jackson Laboratories (Bar Harbor, ME). C57BL/6TacfBR-[KO]Abβ mice were purchased from Taconic (Germantown, NY). C57BL/6-Cd28tmlMak and C57BL/6TacfBR-[KO]Abβ mice are homozygous for targeted disruption of the CD28 gene (CD28−/−) and Aβ(H-2b) gene (MHC class II−/−), respectively 13, 14 . C3H.SW-H2b/SnJ mice are congenic for the H-2b allele 15 . Wild-type and CD28−/− C57BL/6 mice were designated as responder strains and C3H/HeJ and C3H.SW mice as stimulator strains. In addition, we wished to use stimulator mice that were deficient in MHC class II. Because of the unavailability of MHC class II−/− C3H mice, MHC class II−/− C57BL/6 mice were used as stimulators with BALB/c responders. Lymphocytes were isolated from peripheral lymph nodes and spleens of 8- to 10-wk-old responder strain mice, labeled with carboxyfluorescein diacetate succinimidyl ester (CFSE)3 (Molecular Probes, Eugene, OR) as previously described, and transferred via tail vein into whole-body irradiated (1800 rad) stimulator mice (30–40 million lymphocytes/stimulator) 16 . Responder cells were recovered from stimulator spleens to assure sufficient numbers of lymphocytes for flow cytometric analysis at serial time points. Harvested lymphocytes were stained with phycoerythrin-conjugated anti-CD4 mAb (GK1.5; PharMingen, San Diego, CA) and analyzed on a FACScan (Becton Dickinson Immunocytometry Systems, San Jose, CA). CD4+ T cells of responder strain origin were identified in the CFSE+CD4+ gate. Precursor frequencies of alloreactive CD4+ T cells were calculated as previously described 17 . Briefly, discrete generations of alloreactive CD4+ T cells were identified by their CFSE fluorescence. The number of alloreactive CD4+ T cells in each daughter generation was counted using Cell Quest software (Becton Dickinson Immunocytometry Systems), and the number of precursors for each generation was extrapolated using the formula a/2n (a = number of cells in generation, n = generation). For example, 8 daughter cells counted in the third daughter generation would be extrapolated to be the progeny of 1 precursor that divided three times (8/23 = 1). The frequency of alloreactive CD4+ cells in the responder population was then calculated by dividing the total number of precursors from all daughter cells that proliferated beyond background levels by the sum of all precursors and undivided cells. Major histocompatibility Ags are known to yield vigorous primary MLR; however, these assays typically measure incorporation of tritiated thymidine, which only gives a measure of DNA synthesis in vitro 18 . To characterize the kinetics of alloreactive CD4+ T cell division in vivo, we used the fluorescein-based dye CFSE. Labeling of lymphocytes with CFSE yields a homogenously stained population that fluoresces at wavelengths characteristic of the fluorescein moiety of CFSE 19 . CFSE-labeled C57BL/6 (H-2b) responder lymphocytes were transferred into whole-body irradiated C57BL/6, C3H/HeJ (H-2k), and C3H.SW (H-2b) stimulator mice. Responder lymphocytes were retrieved from the spleens of stimulator mice and analyzed for CFSE fluorescence by flow cytometry. In Fig. 1⇓, histograms depict CFSE fluorescence of responder CD4+ T cells at serial time points after transfer. Because of the established property of CFSE fluorescence of labeled cells to halve successively with cell division, in each histogram the undivided parent generation is represented by the peak of highest CFSE fluorescence and daughter generations of alloreactive CD4+ T cells are represented by peaks of diminishing fluorescence on the log scale. In vivo kinetics of CD4+ T cell division after transfer into syngeneic, major histocompatibility Ag-mismatched, and minor Ag-mismatched mice. 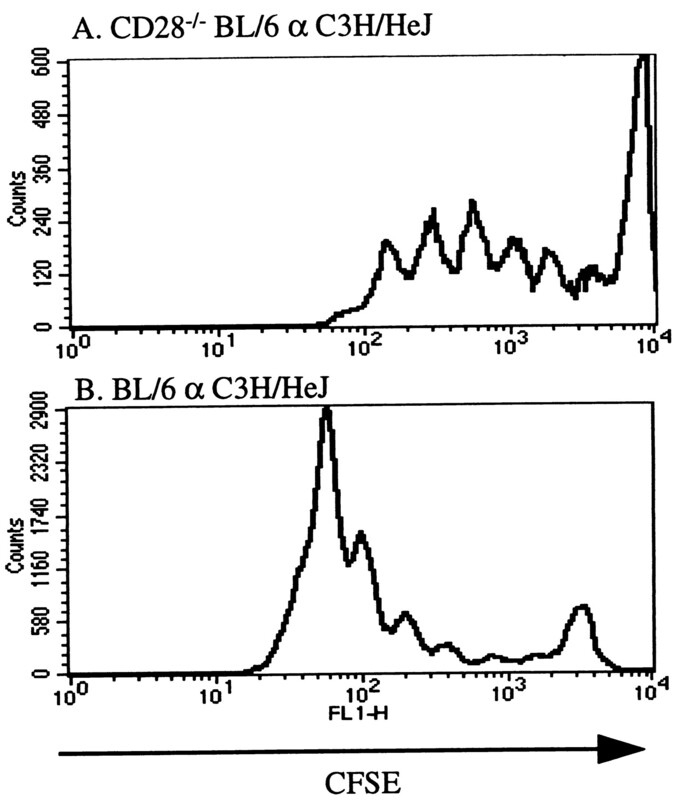 CFSE-labeled C57BL/6 responder lymphocytes were transferred into whole-body irradiated C57BL/6 (A), C3H/HeJ (B), and C3H.SW (C) stimulator mice and harvested from spleens of stimulators at serial time points. 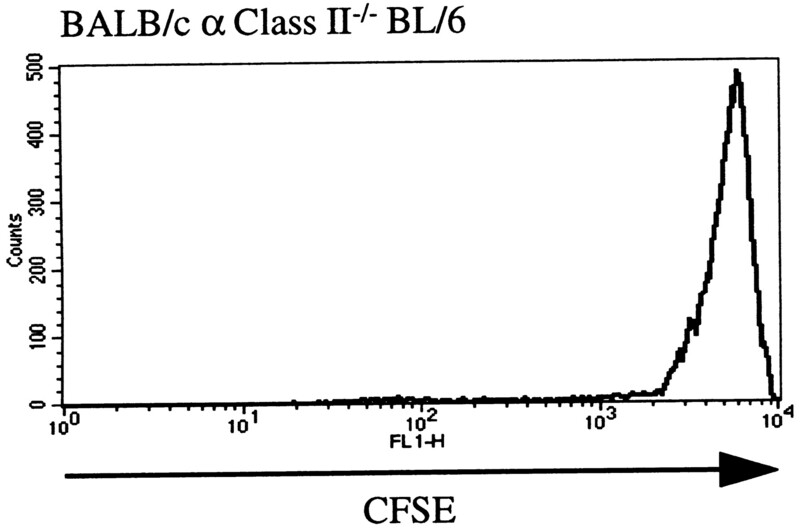 Histograms depict CFSE fluorescence of CFSE+CD4+ cells. Undivided parent generation CD4+ T cells are represented by the peak of highest CFSE fluorescence in each histogram, and alloreactive daughter generations are represented by leftward peaks of diminishing CFSE fluorescence. Results are representative of at least 10 independent experiments. Only a small proportion of responder CD4+ T cells divided after transfer into syngeneic C57BL/6 stimulator mice, even after 84 h (Fig. 1⇑A). This represents the background level of proliferation for this assay. In contrast, responder CD4+ T cells proliferated vigorously after transfer into MHC-mismatched C3H/HeJ stimulators (Fig. 1⇑B). The onset of proliferation was rapid, with alloreactive cells dividing to the fourth daughter generation after 48 h. Proliferation continued through subsequent time points such that by 72 h large populations of seventh and eighth generation alloreactive progeny were recovered. The step-wise production at serial time points of successively dividing daughter generations suggests that proliferating cells represent the progeny of alloreactive cells that underwent in situ activation and division. Compared with the response against major histocompatibility Ags, the CD4+ T cell response against minor Ags encoded by C3H.SW stimulators was delayed and the frequency of alloreactive cells was decreased (Fig. 1⇑C). Division to the third daughter generation by a subset of alloreactive cells was detected after 48 h. At subsequent time points, alloreactive cell division continued to trail the response to major Ags such that seventh and eighth generation progeny accumulated in stimulator spleens only after 84 h. The lower frequency of CD4+ T cells dividing after transfer into minor histocompatibility-mismatched stimulators was apparent because of the small size of daughter generation peaks relative to the undivided parent generation peak. We hypothesized that the proliferative responses of alloreactive responder cells resulted from direct recognition of allogeneic MHC class II on the surface of APCs of stimulator origin. To evaluate this, we used stimulator mice deficient in MHC class II. In contrast to the vigorous proliferation by alloreactive CD4+ T cells after transfer into wild-type stimulators, no proliferation was detected 60 h after transfer into MHC class II−/− stimulators (Fig. 2⇓). This finding confirms that in this experimental system alloreactive CD4+ T cell proliferation is dependent upon direct recognition of allogeneic MHC class II. Indirect recognition of histocompatibility Ags processed and presented in the context of self-MHC class II by APCs of responder strain origin does not contribute significantly to the observed proliferative responses. The practical implication of this finding is that direct allorecognition per se can be studied in this system without the potentially confounding presence of the indirect pathway. Direct recognition of allogeneic MHC class II by CD4+ T cells. CFSE-labeled BALB/c responder lymphocytes were transferred into whole-body irradiated C57BL/6 MHC class II−/− stimulator mice and harvested from spleens of stimulators after 60 h for flow cytometric analysis. Responder CD4+ T cells adoptively transferred into MHC class II−/− stimulator mice did not proliferate significantly as demonstrated by their uniformly high CFSE fluorescence. Results are representative of at least five independent experiments. To assess the role of CD28 costimulation in allorecognition of major and minor histocompatibility Ags, we transferred CFSE-labeled responder cells from CD28−/− C57BL/6 mice into C3H/HeJ and C3H.SW stimulators. CD28−/− responder CD4+ T cells divided less rapidly than wild-type responder cells in response to major histocompatibility Ags. Although a subset of alloreactive CD28−/− CD4+ T cells divided to the sixth daughter generation after 60 h (Fig. 3⇓A), the proportion of alloreactive cells dividing maximally at this time point was lower than that of wild-type responder cells (Fig. 3⇓B). Despite this slowing in division kinetics, alloreactive CD28−/− CD4+ T cells did retain the capacity to divide successively such that the majority of alloreactive progeny accumulated in the seventh and eighth daughter generations after 84 h (data not shown). In contrast, proliferation of responder CD4+ T cells in response to minor Ags demonstrated marked dependence on CD28 costimulation. Minimal division by CD28−/− CD4+ T cells was detected 84 h after transfer into minor histocompatibility-mismatched stimulators (Fig. 4⇓A), in contrast to division to seventh and eighth generations by wild-type CD4+ T cells (Fig. 4⇓B). Allorecognition of major histocompatibility Ag by CD28−/− CD4+ T cells. 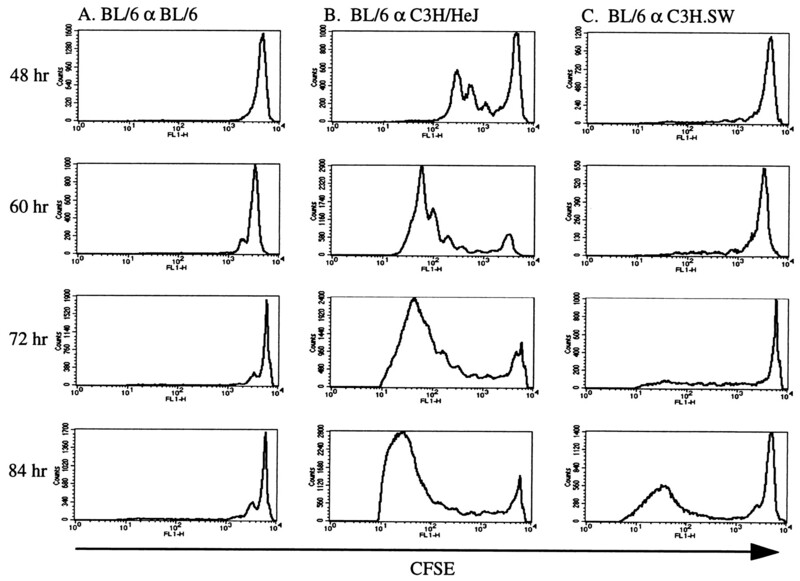 CFSE-labeled responder lymphocytes from CD28−/− (A) and wild-type (B) C57BL/6 mice were transferred into whole-body irradiated C3H/HeJ stimulator mice and harvested from spleens of stimulators after 60 h for flow cytometric analysis. The kinetics of alloreactive CD28−/− CD4+ T cell division were diminished as indicated by the small size of peaks representing fifth and sixth generation progeny compared with wild-type CD4+ T cells. Results are representative of at least five independent experiments. Dependence of CD4+ T cells on CD28 costimulation for allorecognition of minor histocompatibility Ags. 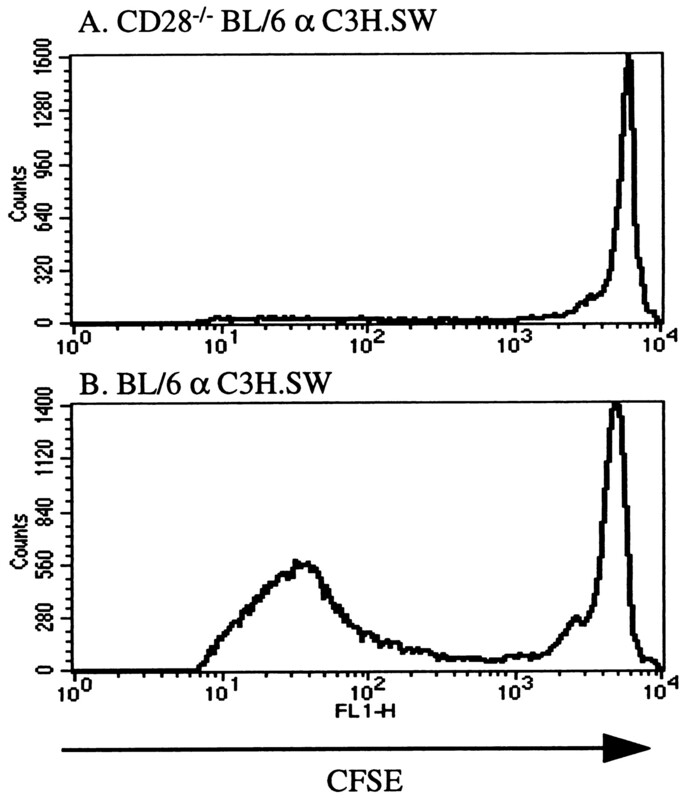 CFSE-labeled responder lymphocytes from CD28−/− (A) and wild-type (B) C57BL/6 mice were transferred into whole-body irradiated C3H.SW stimulator mice and harvested from spleens of stimulators after 84 h for flow cytometric analysis. Proliferation of CD28−/− CD4+ T cells in response to minor histocompatibility Ags was greatly reduced compared with wild-type responder cells. Results are representative of at least five independent experiments. To further define the role of CD28 costimulation in the allorecognition of histocompatibility Ags, we calculated precursor frequencies of alloreactive wild-type and CD28−/− CD4+ T cells that were present in harvested spleens of stimulators over time. The frequencies calculated for CD4+ T cells dividing in response to C3H/HeJ stimulators were high, peaking at 21 ± 2% 60 h after transfer before declining to 15 ± 2% and 14 ± 2% at subsequent time points (Fig. 5⇓A). The decreasing calculated frequencies at later time points is consistent with apoptosis of alloreactive progeny, re-entry of alloreactive progeny from spleens of stimulator mice into the pool of circulating lymphocytes, which has been reported to occur over this time course, and our inability to detect cells proliferating beyond eight generations because of progressive loss of CFSE 20 . Precursor frequencies of splenic CD4+ T cells dividing in response to C3H.SW stimulator mice increased over time from 1.3 ± 0.2% at 48 h to 5.6 ± 0.8% at 84 h (Fig. 5⇓B). This increasing pattern of calculated frequencies is consistent with the delayed kinetics of alloreactive cell division in response to minor histocompatibility Ags noted in Fig. 1⇑. Mean precursor frequencies of wild-type and CD28−/− CD4+ T cells alloreactive to major and minor histocompatibility Ags. 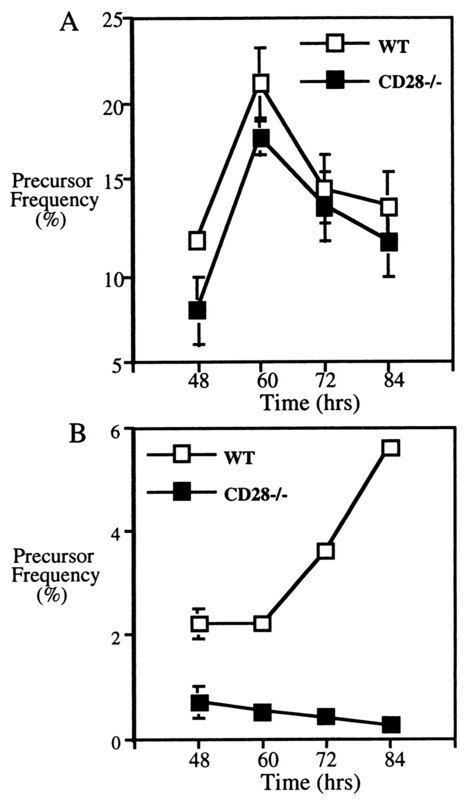 Precursor frequencies of alloreactive wild-type (WT) and CD28−/− C57BL/6 CD4+ T cells were calculated after harvesting responders at serial time points after transfer into C3H/HeJ (A) and C3H.SW (B) stimulator mice. The frequency of CD4+ T cells alloreactive to major histocompatibility Ags was marginally decreased in the absence of CD28 costimulation while the frequency of CD4+ T cells responding to minor histocompatibility Ags was sharply decreased. Error bars represent SD of at least four experiments for each time point. Precursor frequencies of CD28−/− CD4+ T cells alloreactive to major histocompatibility Ags were modestly decreased when compared with wild-type responder cells (Fig. 5⇑A). In contrast, precursor frequencies of CD28−/− CD4+ T cells alloreactive to minor histocompatibility Ags were sharply decreased at all time points compared with wild-type responder cells (Fig. 5⇑B; 0.24 ± 0.05% vs 5.6 ± 0.8%, respectively, after 84 h; p < 0.01). Collectively, these findings indicate that a small subset of alloreactive CD4+ T cells requires CD28 costimulation for recognition of major histocompatibility Ags, while a much larger proportion of CD4+ T cells potentially alloreactive to minor Ags requires CD28 costimulation for allorecognition to occur. The precursor frequency values calculated by these means are uniformly higher than previous estimates of 1–10% for CD4+ T cells alloreactive to major histocompatibility Ags 6, 21, 22 . We attribute this discrepancy to sequestration and enrichment of alloreactive cells in the lymphoid organs of stimulator mice, as has been previously reported 20, 23, 24 . In vitro stimulation of CFSE-labeled responder cells allowed unbiased calculation of alloreactive precursor frequencies for major histocompatibility-mismatched strain combinations that fell within the previously reported range of 1–10% (data not shown). Findings from this study highlight the unique signaling processes that lead to recognition of major histocompatibility Ags. T cell activation has been shown to result from the engagement of a threshold number of TCR-Ag interactions, with CD28 costimulatory signals lowering the threshold for activation 25 . Here, recognition of C3H-encoded peptides in the context of allo-MHC rather than self-MHC led to more rapid division by alloreactive CD4+ T cells with decreased requirement for CD28 costimulation. The potency of direct TCR-allo-MHC interactions allowed many CD4+ T cells to achieve their activation threshold without CD28 costimulation. In contrast, TCR-self-MHC interactions failed to achieve activation threshold for the majority of CD4+ T cells specific for minor Ag unless CD28 costimulation was provided. Blockade of costimulatory pathways has been used to prolong or induce permanent survival of transplanted organs in a number of experimental models, although precisely how these regimens work remains unclear 26, 27, 28, 29 . Our findings indicate that direct recognition of allogeneic MHC is relatively resistant to the blockade of CD28 costimulation, whereas recognition of histocompatibility Ags in the context of self-MHC may be more susceptible to such interventions. Therefore, prolongation of allograft survival by CD28 costimulatory blockade suggests that indirect presentation of histocompatibility Ags may be the dominant pathway of Ag presentation leading to rejection in these transplantation models. Future studies using this experimental system may define how other signaling pathways help set the threshold for allorecognition and allow efficient testing of strategies aimed at abrogating these responses. ↵1 This work was supported by National Institutes of Health Grant DK34878. H.K.S. was supported by a postdoctoral fellowship from the Juvenile Diabetes Foundation International (#397051). ↵2 Address correspondence and reprint requests to Dr. Ali Naji, Department of Surgery, 4th Floor Silverstein Pavilion, Hospital of the University of Pennsylvania, 3400 Spruce Street, Philadelphia, PA 19104. ↵3 Abbreviation used in this paper: CFSE, carboxyfluorescein diacetate succinimidyl ester.